Malaysia had never been very high on my bucket list. The only reason we decided to go was that the cheapest flight from Chiang Mai, Thailand was to Kuala Lumpur. Georgetown turned out to be one of our favorite places. 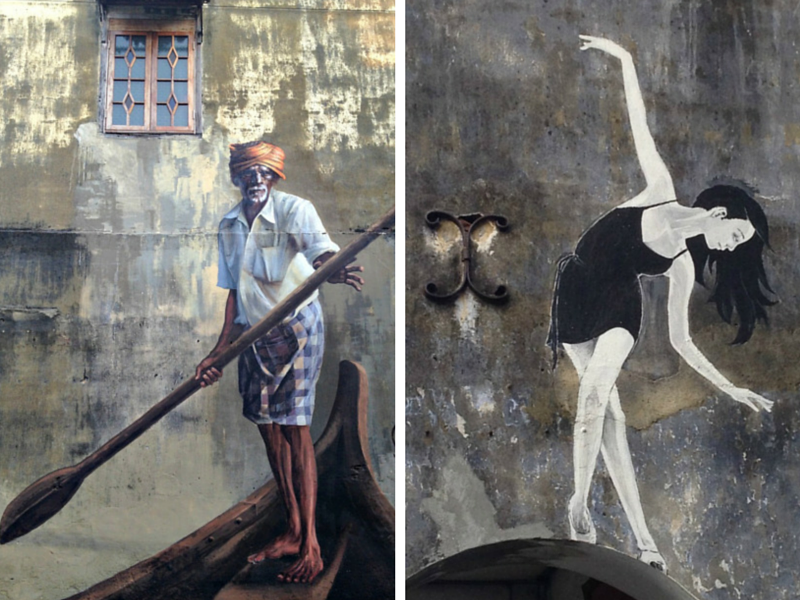 Throughout the historical area of Georgetown, you will come across large murals painted by the Lithuanian artist Ernest Zacharevic. You can download a pdf map marking their locations from Tourism Penang. 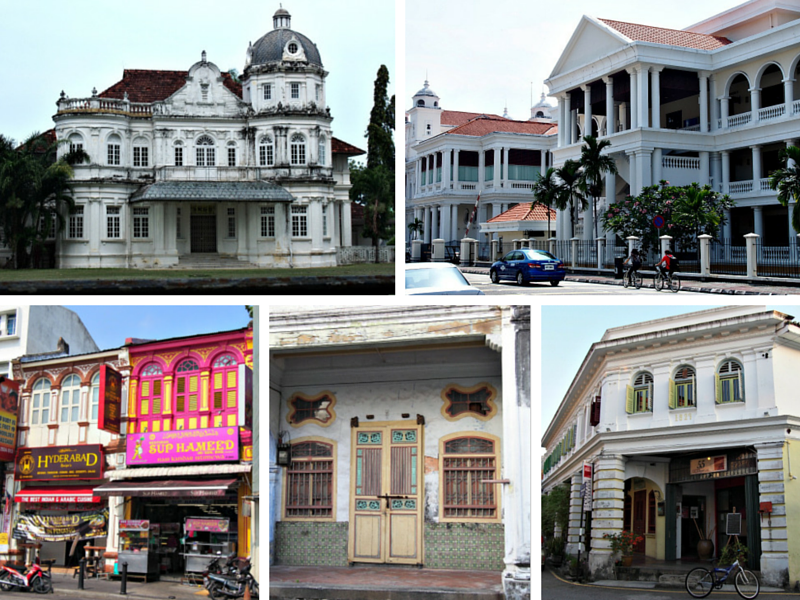 Colonial buildings and shophouses in Georgetown. 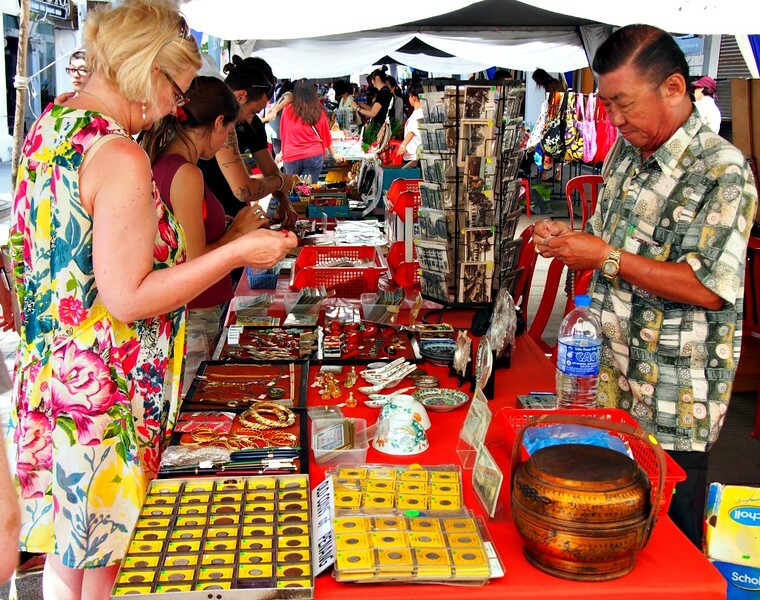 The Little Penang Street Market is open the last Sunday of every month from 10am to 5pm on Upper Penang Road. Don’t expect the usual tourist junk here. Instead, there is an eclectic mix of old coins, vinyl records, random bric-a-brac, vintage clothing, arts and crafts, and homemade desserts. It is a pleasant way to spend an hour. We spent the first night at a terrible, small hotel in the Little India neighborhood. The next morning, I walked around to find a better place and found 75 Travellers Lodge on Muntri Street. I looked at a lot of small hotels and guesthouses in Georgetown and 75 Travellers Lodge was the best budget option I saw. 75 MYR (about 18.64 euros) for an air-conditioned, double bed, ensuite room. A private single room with shared bathroom goes for 42 MYR (about 10.45 euros). Good location on Lebuh Muntri. Walking distance to restaurants, cafes, and an excellent night market. Friendly and helpful staff that speak perfect English. Can book transportation and tours at a reasonable price. There is no television in the room. The WIFI can be a little spotty at the end of the hall but it works fine in the lobby and there are several cafes on the same street. There are several other budget friendly guesthouses on this street that looked like good options and not all of them are on the major booking engines. I think you would be safe to show up without any reservations and find something on this street. The main reasons that I am recommending this street over the popular backpacker’s area of Chulia Street are: 1) very short walk to an excellent food market 2) this street is much cleaner than other areas 3) proximity to cafes with good WIFI 4) there is a cat cafe on the same street. There are also budget options on Love Lane and Chulia Street. I would avoid staying in Little India as the guesthouses I saw were dirty and run down but you will definately be going there for food. I would also avoid the area around Gurney Drive unless you don’t mind taking a taxi every time you want to go somewhere. Clockwise: Little India, Red Garden, Indian restaurant in Little India, Nasi Lemak, White Curry Mee. Many places in South East Asia are renowned for their street food but Georgetown is the only place I have found that truly lives up to the hype. I don’t think that I ever had a disappointing meal there. Little India – The cheapest Indian food you will find outside of India. I have never understood why Indian restaurants are so expensive in the United States and most of Europe. 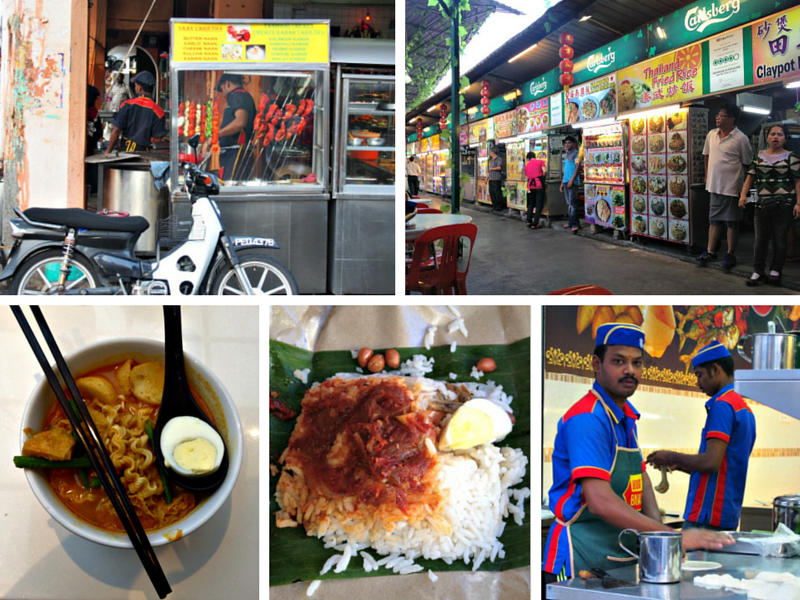 Here in Little India, you can indulge your desire for spicy curry every night if you wish. The street hawkers sell tasty treats like egg samosas that you never find in Indian restuarants in Europe. Red Garden Food Paradise – This is a large group of permanent hawker stalls surrounding a covered seating area. Pick your table, order from one of the stalls and they will bring your order to the table where you will pay. A waiter will also come by your table to take your drink order. The variety of food here is incredible. You can get anything: Malay, Chinese, Indian, Western food, Filipino, Thai and barbecued seafood. Adventurous eaters can try the frog porridge. Those with more reserved palates can get a cheap plate of chicken rice or find something familiar at the stand marked Western Food (burgers, fries, spaghetti, etc. ).You could eat here every night for months and never have the same dish twice. The health department conducts regular checks here and you can see into most of the kitchens which all looked clean. Gold Choice Lifestyle Cafe – When you have been travelling for a long stretch, sometimes you just want decent scrambled eggs and toast for breakfast and this was the only place that I found with good scrambled eggs. We ate here every morning because Little Nomad loved the breakfast. The lunch menu was overpriced and disappointing.